Ekkokammer is a staged piece, directed and composed by Maja S. K. Ratkje for Trondheim Voices. 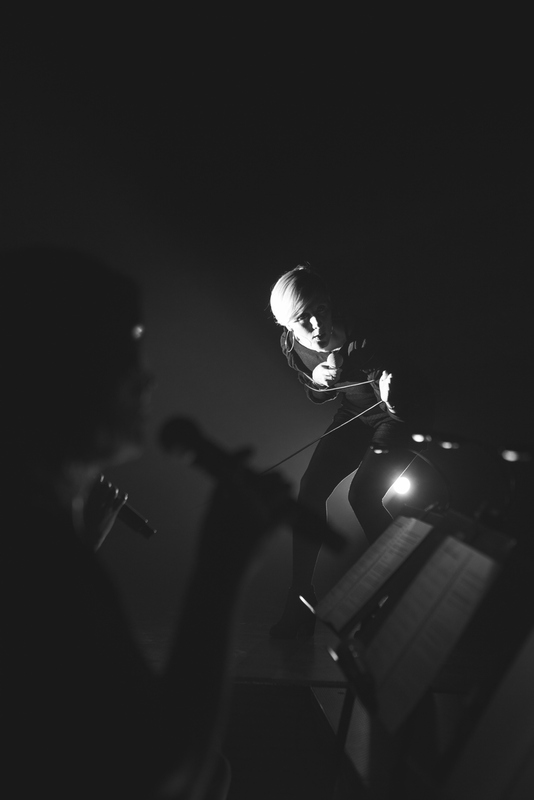 Since 2014 Ratkje has been collaborating with the avant garde vocal ensemble Trondheim Voices to create a work in progress called Ekkokammer (in English: Echo Chamber). This has resulted in two editions so far, Ekkokammer 1.0 and Ekkokammer 2.0. Ratkje has interviewed the singers in the ensemble privately about finding their voice, the singer’s role and what it means to have a voice, metaphorically as well as physically. What do you wish to express with your voice? Isn’t it enough to just sing nicely and get popularity? The singers’ own answers and thoughts to these questions combined with their own experiences around finding their voice from childhood memories till today is staged in peculiar ways in the piece. All spoken text is excact transcriptions from the taped conversations with Ratkje, but is spread among the singers in the finished piece, so the true author of a spoken line is never exposed, you’ll never know, perhaps is the actor also the initial owner of the line. The transcripted lines are exactly written as originally spoken, with mistakes, with hesitancy, in their own dialect. This gives sometimes an odd distance to the text when performed, and also questions another big discussion around the singer’s role: autenticity. Is a singer’s statement more valid emotionally if it’s real? What is real? One of my statements are: when it’s staged it’s never “real”, even though it’s based on authentic experience, but what’s real for the audience, for their own reflection is as real as it gets, it’s here, in the meeting with audience, that art can be of great value and touch reality in ways that you haven’t thought of before. The piece is so far only performed in Norwegian, but can be translated to English. A book, Av og til så kan det jo bli kunst, with quotes from the interviews with the singers, a different selection than in the staged work, edited by Ratkje was released on Beijing Trondheim for the premiere of Ekkokammer 2.0.
and see more pictures here.